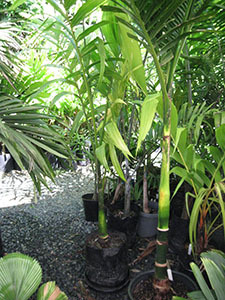 This is an attractive small/medium sized solitary palm reaching about 10 metres tall after 15-20 years. It is viable in the subtropics but requires mostly shade when young, and protection from cold/dry winds. 140mm $19.50 Special price: $0.00. No online sale.